The challenge to shoulder the financial burdens of Fukushima is posed to a financial system which is still in the process of recovering from a long-lasting economic and financial crisis that resulted in a fundamental restructuring of the financial industry. Whether and to which extent Japan’s financial institutions will succeed in smoothly fulfilling the extraordinary task to provide the huge amounts needed for compensation, reconstruction and economic recovery, and channel them into the right uses, will also depend on the question to which extent the system has digested the preceding crisis. 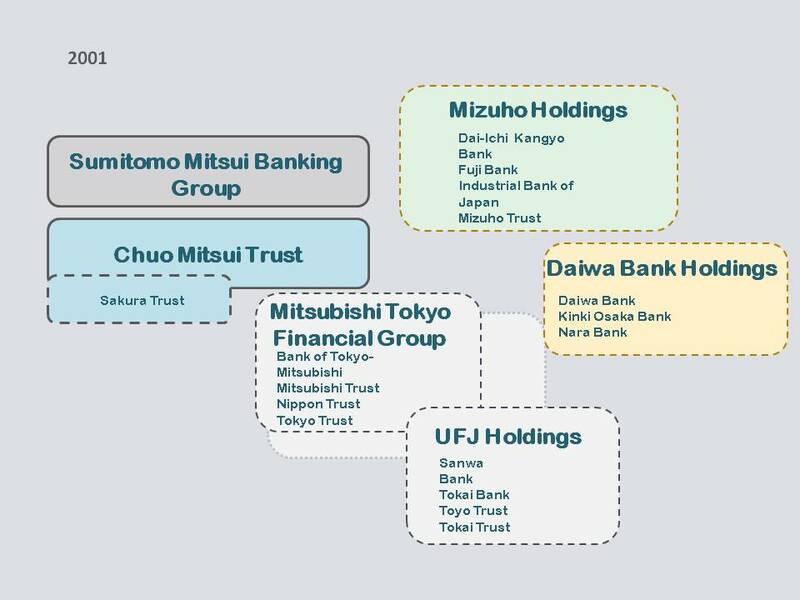 A look at the transformation of the Japanese banking structure will provide some clues. In the 1980s Japanese financial markets experienced a dramatic rise in land and stock prices. This triggered a speculative bubble which gradually seized the whole economy. Financial institutions of all sorts were involved and suffered badly when in 1990 the bubble burst. In the restructuring process that followed many did not survive. Others sought shelter under the roof of the giant holding companies that emerged in the orchestrated effort of government, bureaucrats and industry to restore financial soundness and stability. 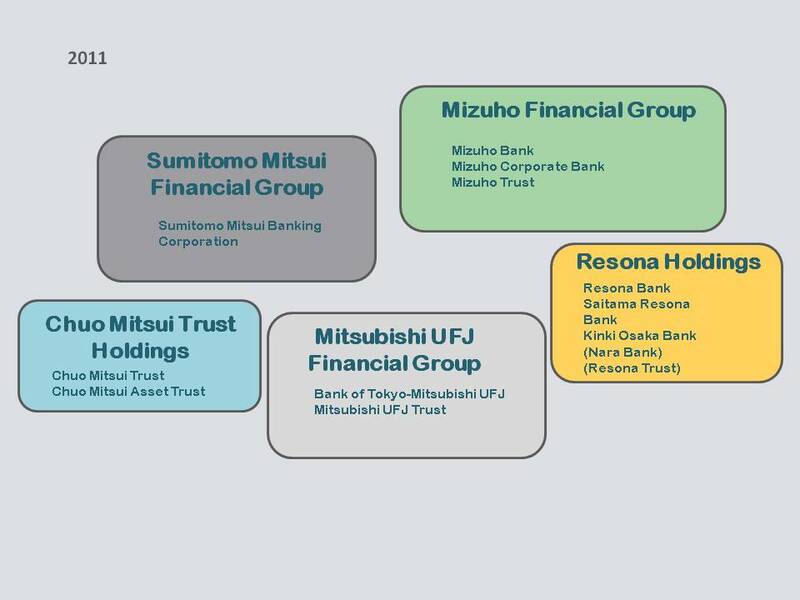 Going backwards in tracing the transformation process from the current state to the “pre-holdings” era at the end of the 1990s (compare Japanese Bankers Association) demonstrates the various steps of this process. and one specialized foreign exchange bank, Bank of Tokyo, the successor of the Yokohama Specie Bank. For the details I would like to refer you to my book on the Japanese Foreign Exchange Market, chapter 2. In addition, there were countless nonbank financial institutions such as money lenders, leasing firms and real estate agents which during the bubble became the vehicles for speculation allowing banks to circumvent official regulations. This category includes two institutions which are directly linked to the transformation process, the Second Bridge Bank and the Resolution and Collection Corporation (RCC). 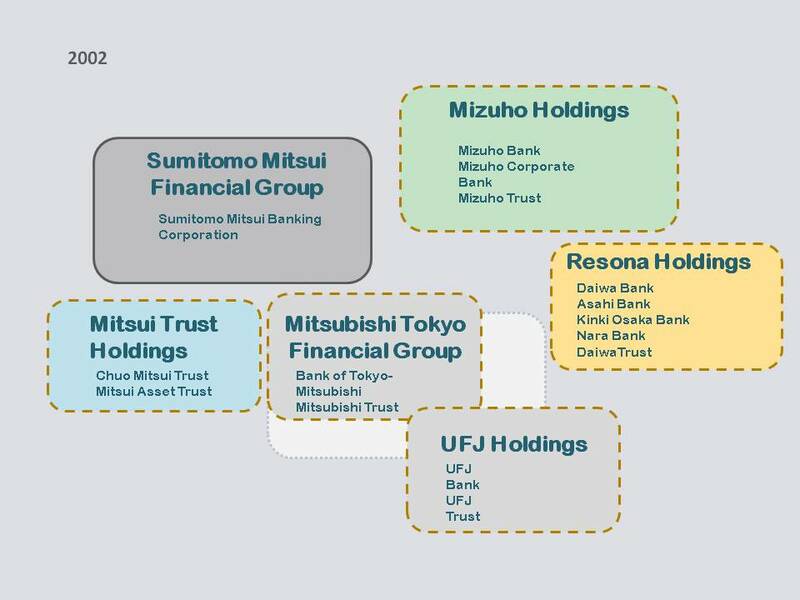 Both were established as subsidiaries of the Deposit Insurance Corporation of Japan (DICJ) and are in charge of disposing of undesirable remainders of the financial crisis. Details … Their very existence is a first indication of still prevailing unsolved problems. Changes in banking structures also altered industrial structures in Japan. 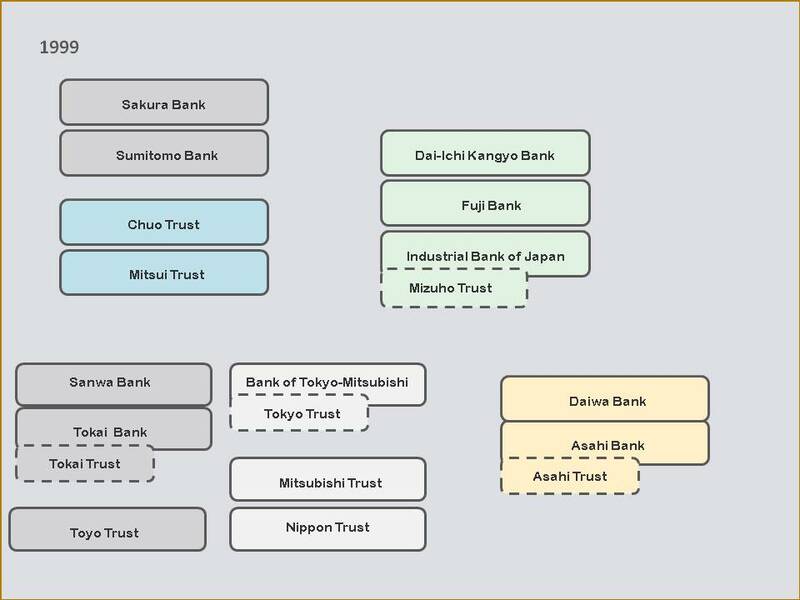 Traditionally, different kinds of banks are strongly linked to the big Japanese industrial groups or keiretsu. Those are seemingly loose groupings of manufacturers, distributors and finance companies characterised by cross shareholdings, regular meetings of executives from member firms, interlocking directorships and countless unwritten obligations (compare Ito 1992). In 1990, the eight biggest groups contained about 900 companies – plus banks and insurance companies. Each keiretsu can be imagined as representing a cross-section of the economy, and the banks fulfill special tasks in this network. The most important ones are city banks that serve as so-called main bank for their respective groupings. Beside providing funding they exert a strong informal influence on members and assume far-reaching responsibilities. There are two different kinds of keiretsu, old and new ones. The old ones have their roots in the pre-war zaibatsu, large conglomerates which were said to exert virtually perfect control of the economy up to their break-up after World War II. 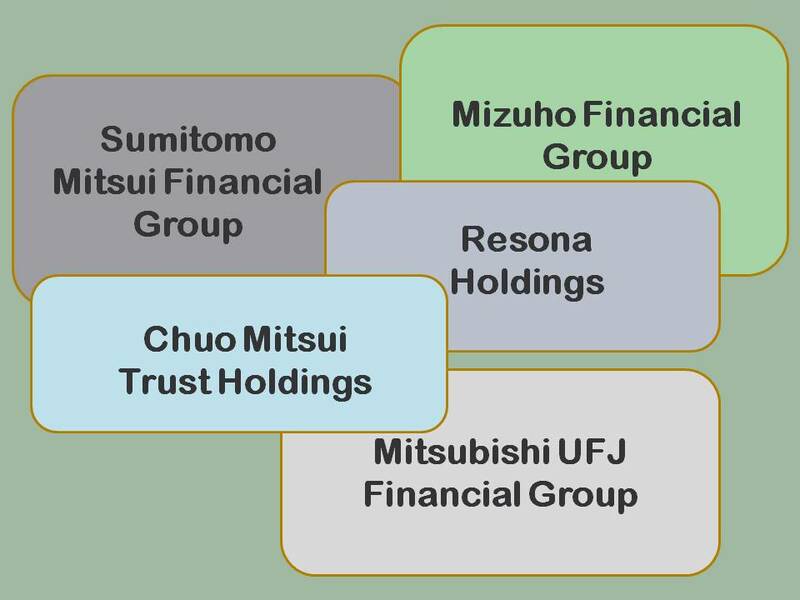 This group consists, above all, of the “Big Three”, Sumitomo, Mitsubishi and Mitsui. A look at the prevailing structure of financial holdings shows that despite many changes, much of these old relations apparently survived. It is also an indication that the old ways of policy making by “administrative guidance” exploiting these relations and the accompanying close ties between government institutions and private firms may be still more or less intact. This raises the question how successful the transformation has been so far and whether, at least to some extent, recent institutional changes served to disguise remaining weaknesses rather than contributing to their elimination. make banks get a more realistic view on the value of loan collateral and borrowers’ capacity of repay with respective consequences for reported capital ratios. If this impression holds true, Japan’s financial system appears badly prepared for the latest challenges and authorities might well regret not to have shown more courage when there was only one crisis to cope with.